So today we're talking milestones. I'm not a milestone fan, primarily because Jake took forever to hit the primo importante Smile Milestone. 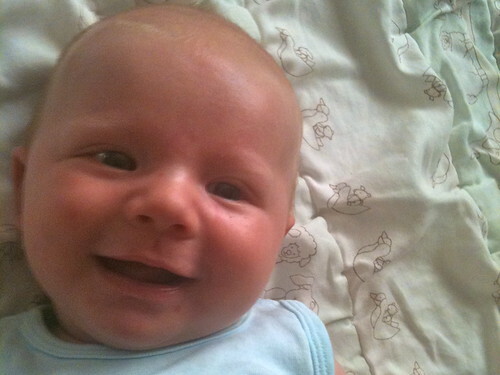 Thanks to Babycenter, when Jake was 4 weeks old I began holding my breath in rapt expectation of that glimmer of joy. I watched and I waited and I waited and I prayed, but nary a smile was in sight. Two months old, friends, two months before I got a grin. 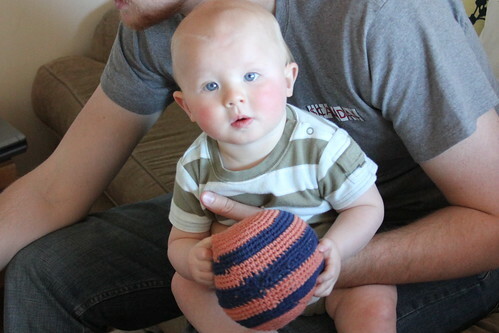 I dutifully noted on the blog when Jake first started saying "ball." Well "ball" still makes up 90% of his vocabulary. Anything vaguely spherical, circular, or cylindrical is a ball. If it bounces it's a ball, if it rolls it's a ball, if it gets thrown it's definitely a ball. "Ball" peppers his days and consequently mine too. It's the first thing he says in the morning; he sings it in the car; he shouts it in the tub and murmurs it in his sleep. My mother reminds me that saying "ball" early runs in the family. Jake has an uncle who also shares the fascination. It was my brother Scotty's first word. On a car ride home one night as a "ball"-loving little tike, he famously looked up into the sky and so dubbed the moon. Jake does say other things. Well...three. He says three other things. And I'm not sure he knows what they mean. One is the obligatory "mama." While he is slowly associating this with me, "mama" is also my iPhone, airplanes, our neighbor's dog, and Jacob (even though Jacob is often called "ball ball"). So I have a kid who runs around all day saying Ball, Go, and Uh Oh...I know...I'm nervous, too. And finally, the reason for this milestone-ish update: Jake took his first steps on Monday - his first steps at a not too shabby 13 months old. He still only walks when he's in the yard or at the park, and he's very particular about this, but I'll take what I can get. I've posted a video of a couple steps here for those of you who want to marvel at his 17 seconds of agility. Jake Man Walking from therhodeslog on Vimeo. Go see Jen for all the Quick Takes. And Happy Friday! Awww, he's sooo cute!! My niece is a little bit younger and she does the clapping thing too, love it :) And well done on your half marathon, I'm thinking about attempting a 5k. He really is the cutest little boy.